In spice grinder, pulse 1/4 cup of the toasted sesame seeds to a fine powder. Transfer the ground sesame seeds to a medium bowl. Add the mayonnaise, rice vinegar, soy sauce, mirin and lemon juice to the bowl, and whisk until smooth. Season the toasted sesame dressing with salt. In a large bowl, cover the wakame with 1 inch of cold water. Let stand at room temperature until the wakame is hydrated and tender, about 2 minutes. Drain and, using your hands, squeeze out the excess moisture. 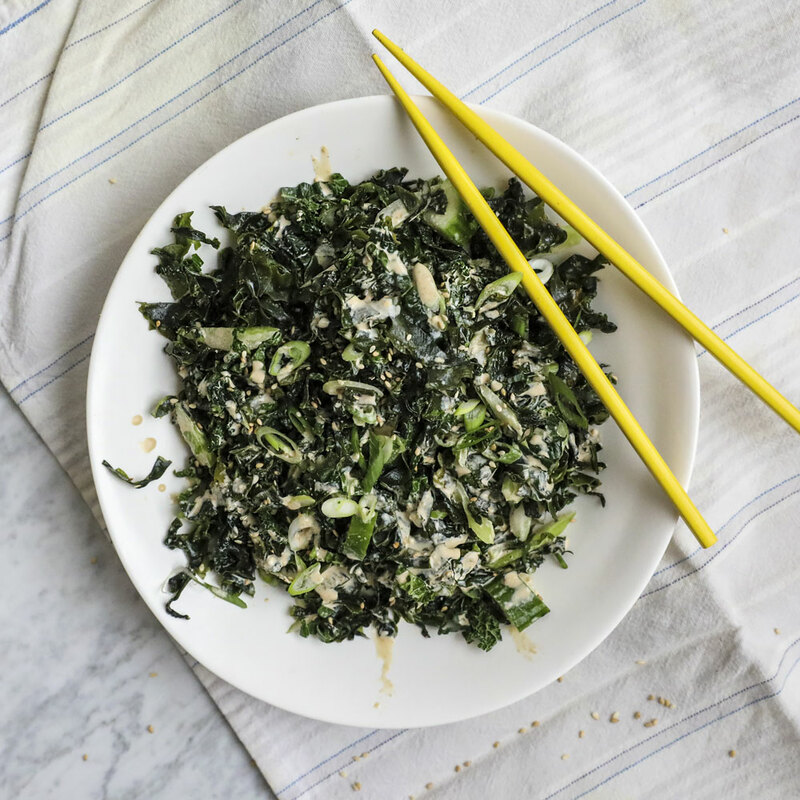 Transfer the wakame to a serving bowl and add the kale, cucumber, scallions and celery. Toss with half of the toasted sesame dressing until well coated. Sprinkle the salad with the remaining 1 tablespoon of the toasted sesame seeds. Pass the extra toasted sesame dressing at the table. The toasted sesame dressing can be refrigerated in an airtight container for about 4 days. Let come to room temperature before proceeding with the recipe. Look for Kewpie mayonnaise (which is made with rice vinegar and is very popular in Japan) at Asian markets.